SrIvaishNava Education Portal | Learning is fun – Where there is true knowledge, there is bliss. Part of koyil.org initiative. 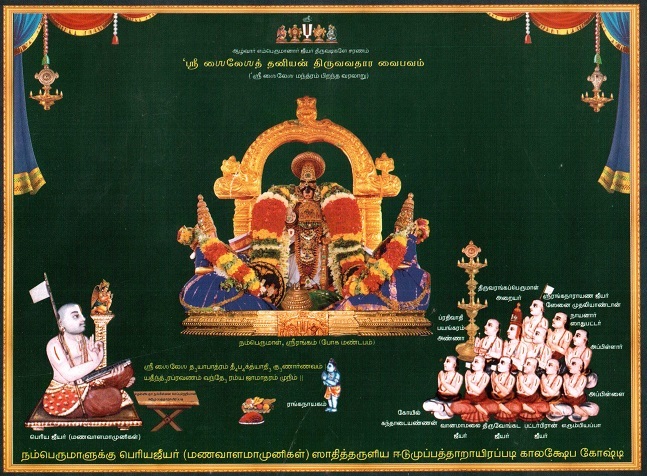 SrIvaishNava sampradhAyam is made of a rich philosophical/value system. Even young children have a great role to play in this sampradhAyam. Right from the young age, children should be nurtured with the wonderful value system, devotion, renunciation, etc. piLLAi/piLLai (in thamizh) means a child as well as a new comer to the sampradhAyam. 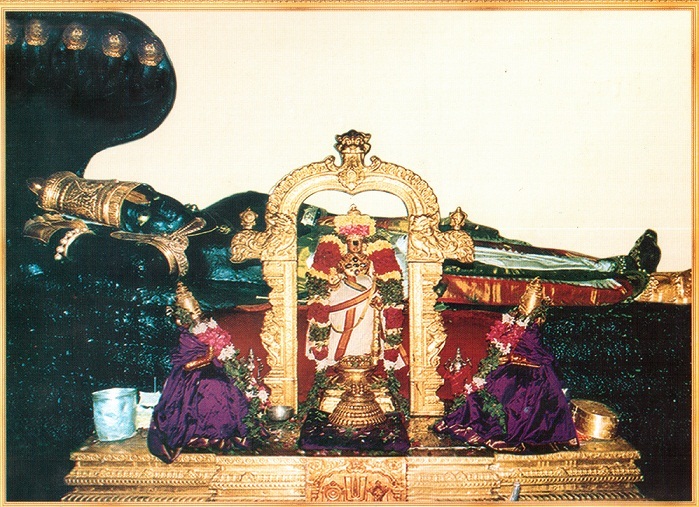 SrIranganAthan himself is called as kOyilpiLLAi – kOyil refers to SrIrangam and piLLAi refers to krishNa. periya perumAL (mUlavar at SrIrangam) is often explained as kaNNan emperumAn and namperumAL (uthsavar at SrIrangam) is often explained as SrI rAma. 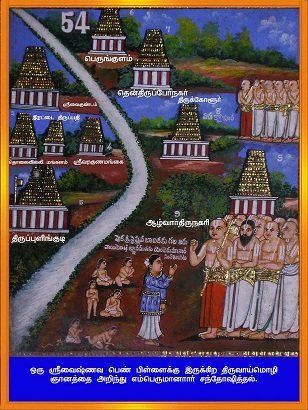 In thiruppAvai, 7th pAsuram, ANdAL says “piLLAi ezhunthirAi” – here piLLAi is explained as a new-comer to bhagavadh vishayam. thirumangai AzhwAr explains in periya thirumozhi that “kaNapuram kaithozhum piLLaiyaip piLLai enReNNap peRuvaRE” (கணபுரம் கைதொழும் பிள்ளையைப் பிள்ளை என்றெண்ணப் பெறுவறே) – One who worships thirukkaNNapuram, even he/she is a small (or ones own) child, one cannot think them like a child – he/she should be thought as a SrIvaishNava. SrI rAmAnuja observed children playing in SrIrangam. They were enacting the activities at the temple and at one point they called out for SrI rAmAnuja. As he was there, he immediately went in front of them and accepted the honors as he would do in the temple in front of SrIranganAthan. Similarly, when he met a small girl outside thirukkOLUr (dhivya dhEsam near AzhwAr thirunagari), he enquires from her why she was leaving town. 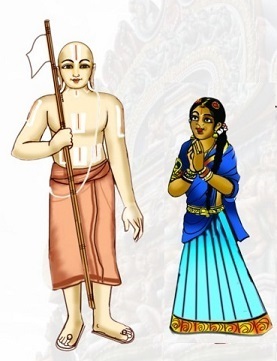 At that time the girl rhymes off wonderful philosophical points and SrI rAmAnuja is amazed at her brilliance and knowledge in sampradhAyam principles. This conversation is famously known as thirukkOLUr peN piLLai rahasyam. He meets another small girl while going to AzhwAr thirunagari and asks her how far is AzhwAr thirunagari from where he was. She very cleverly says it is very near-by citing nammAzhwAr‘s pAsuram. He becomes delighted to hear that and greatly appreciates her. He also acknowledged the greatness of parAsara bhattar even when bhattar was a small child and instructed his sishyas to treat bhattar like himself. Finally, when mAmunigaL completed bhagavadh vishaya kAlakshEpam in front of namperumAL, emperumAn himself appears as a small boy, accepts mAmunigaL as his AchArya and submits him the most famous “SrISailESa dhayApAthram” thaniyan. piLLai is also a honorary term for advanced scholars. For example, vadakku thiruvIdhi piLLai, periayavAchAn piLLai, nAlUr piLLai, nAlUrAchAn piLLai were few AchAryas who had the title “piLLai” in their name itself. Thus, children could be nurtured to grow from innocent level to highly intelligent level through proper education in this glorious sath sampradhAyam principles. This website is our first step towards building a rich repository of resources to educate children and new comers in this wonderful philosophy, value system, discipline, etc. We request the parents and elders to engage their children in such spiritual activities and develop their knowledge in our sath sampradhAyam. Though this website is primarily focussed on children, there is a lot of interesting puzzles, presentations, etc., that are very useful all sections of SrIvaishNavas. Kindly make use of the resources to the fullest extent. Your feedback will be greatly appreciated. Happy Learning! Good information so Mana Telugu state lo nithya vishnavam devalap ments district so mandal so Villeges lo devalap khavali. I just want to ask whether the following article is useful to teach children our sampradayam, as your reply relates??. wonderful. we need these kinda of initiatives. some more thing can also be done which children can directly read and understand or with parents help. Appreciate your efforts on trying to educate and spread the sri vaishnava sampradayam. Not only kids but naive adults must also visit here often and strive to get blessings from Bhagavan Sriman Narayana. Very Nobel initiative.. This site is not only for kids even adults can learn many things. Long live your service to spread Sri Vaishnava.. Probably given by SrI rAmAnuja’s Sishyas. Adiyean is thankful to you if I am able to get some regular info from this web pages. thanks for the feedback and the thoughtful attitude of sharing this with others. * Ideally, share the link to the articles, so that readers can visit the website, view the article and give their feedback as well. * if articles are copied and pasted, kindly share the full article as it is, with a link to the original article. குழந்தைகளுடன் நானும் படித்து அனுபவித்துத்தெரிந்துகொளகிறேன.என வயது 70. Wonderful Presentation Swami. Pallandu vazha prarthikirome. thanks for the feedback. we will try to do that going forward. wonderful. very good initiative. keep doing good service. வைஷ்ணவம் பற்றிய விஷயங்களே இனிமையானவை ! குழந்தைகள் உட்பட அனைவரும் படித்து இன்புறவேண்டும் என்பது எனது பேராசை ! Yes – We have already started translating Beginner’s guide in to thamizh. We will be pursuing other articles in thamizh as well. Right now we have http://guruparamparaitamil.wordpress.com and http://srivaishnavagranthamstamil.wordpress.com both of which have plenty of articles in thamizh. Adiyen Mrs A.K.Mythili is moved to tears by this great Yeomen service rendered by Sri vaishnavite youngsters like your good self your team members, Sri Velukudi swami Sri M.A.V swami ,Sri K.B.Devarajan swami Sri sreenidhiswami Sri ARL swami& others I am watching on youtube.I salute to the cause of this divine project. What a peerless service for the cause of children on our Sri Sampradhayam. As Thodaradippodi Azhwar says ” KaruvilE Thiruviladhir Kalaththai KazhikindfirE” it our duty to instill in the minds of young ones the greatness of our Sampradhayam. service continue . Regards , Gouri Nagarajan / Tanjavur Sitaraman Nagarajan . My mind has come in towards clarity. I do not know whether it will continue to do so, by accessing this site or again go back to the usual chores. But at least for a few minutes it was kept on the right path. Thanks only to Sriman Sarath thothadri. Adiyen Srinivasa Dasan. ஸ்ரீ வேதாந்த தேசிகரின் சில்லறை ரஹஸ்யங்கள் என்ற ஒரு நூலைக் கண்டேன். அதில் ஸம்பிரதாய பரிசுத்தி என்று ஒரு ரஹஸ்யம் வாசித்தேன். அந்த சுவாமி எழுதியிருந்தது சரிவர புரியவில்லை. இதற்க்கு நம் PBA சுவாமி ஏதேனும் உரை எழுதியுள்ளாரா. சின்ன கிரந்தம்தான். இருந்தால் இதை நெட்டில் வாசிக்கமுடியுமா?. லிங்க் தேவை.